“Don’t Care about Social Status in Playing ‘Bassball’!”. September. 26, 2002 22:56. by Hee-Kyung	Kim susanna@donga.com. It may not be fair to say that they are good. But there are some movies that draw people with irresistible attraction. 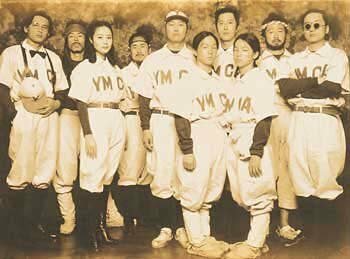 YMCA Baseball Team may not have that attraction, but it is a film that feels like an innocent, smiling person everybody likes. YMCA Baseball Team takes the days of 1900s as its background. It takes as its subject the first baseball team in the Korean history, which was born in the process of taking in new western culture. It is basically a comic movie featuring a baseball team consisting of people of various generations “armed” with straw shoes and laundry bats. It, however, depicts all of these in warn tone. A local Confucian scholar Ho-chang (Song Kang-ho), who more likes physical activities than studying, is idling around with the national exam for government employees discontinued. One day, he meets missionaries and a new-generation woman Jung-rim (Kim Hae-soo) and falls in love with baseball. Jung-rim establishes YMCA Baseball Team. But its members are from all quarters of life: twins whose family is so poor that they have to work in their early days, Confucian scholars, noblemen, slaves and merchants. Ho-chang, against his father’s (Shin Goo) wish that his son would live a life of a Confucian scholar, secures himself the position of the best hitter in the team. Then, he helps his team beat other teams game after game, and stand on top. But after the Ulsa Protection Treaty, the team faces the risk of dismissal for its involvement in an independence movement. It is hard to depict an epic in terms of a comedy. But this movie has succeeded in that regard. Especially, it is highly plausible for its successful transformation of the dark days under the Japanese occupation into days of joy and happiness. The computer graphics and special effects, which have been optimally used, instill a taste of a comic book into the movie, Nonetheless, it sometimes feels that development of story is not so smooth, and that humor and characters shown in the film do not look “mature.” But the last scene of this film, which is the highlight of it where the Korean team takes on the Japanese team, is enough to write off the “immature” aspects of it with touchy and happy feelings. The performance of the main actor Song Kang-ho is sufficient enough to hold the gravity field of the movie. He stands out not only in comic scenes, but also in the scenes which give dramatic touching. Also standing out are the performances of assistant actors and actresses: for example, Shin Goo who plays again as the father of Song following the same character in King of Foul and Kim Joo-hyuk who plays the character of Oh Dae-hyun who throws fast balls. Director of this movie Kim Hyun-suk is a renowned baseball mania. His scenarios have been about baseball and even his debut was made with a movie about it. Of the total money used (i.e. 4.2 billion won = circa. $3.5 million), the staff invested 600 million won in setting up large-scale open sets in Chonjoo and Imsil to recreate the streets of Seoul and baseball stadiums in 1905. Viewable by all ages. Coming to theaters on Oct. 3, 2002.